The SimpleTruth: Transformational Care is Preventative, Immediate, Effective, Empowering, Supportive, Educational, On-going and Affordable. Designed with you in mind, the new standard is easily accessible and gets results, so you can get back to focusing on what matters the most. Immediate care is clinically proven to provide superior results including accelerated recovery time and avoiding unnecessary surgeries, procedures and prescriptions. Designed by physicians using the same methodologies applied in a clinical setting, we mimic the clinical decision-making of a physician in the moment care is needed. The platform adapts to users’ unique circumstances, abilities and personal goals. Their plan is optimized based on the feedback they provide after each session. Support is provided 24/7/365 by three progressive tiers of expertise ranging from Health Coaches to Physical Therapists to 20 Board Certified Physicians. Patients report the high cost of co-pays and deductibles, having to take time off work, find childcare, and the cost (or lack) of transportation as barriers to treatment. SimpleTherapy break downs these barriers and allows patients to take an early musculoskeletal conservative measure that enable them to overcome chronic musculoskeletal pain without drugs or surgery. The stretches and exercises have diminished my pain by at least 50%. I look forward to doing this instead of popping pills, which was not helping. Thank you. Research demonstrates that most MSK-related conditions can be managed or eliminated through the use of early, conservative measures such as exercise therapy. SimpleTherapy is designed by physicians using the same methodologies applied in a clinical setting, SimpleTherapy has the ability to instantly and accurately optimize your care pathway using artificial intelligence and drawing from our extensive database curated over seven years in the moment care is needed. Our personalized, evidence-based exercise therapy program provides support for your population across the spectrum. Technology built for consistent and smart engagement is crucial to a program and its user's success. SimpleTherapy is designed to fit seamlessly into a participant's life with easy, 24/7 access to program allowing the user to take control and get care needed at their convenience. Value and ROI don't begin and end at the user. SimpleTherapy further maximizes engagement by offering rewards, peer support groups and on-demand health coaching. Majority of SimpleTherapy participants report an increase in employer or health plan appreciation. We take the guesswork out, so you can simply follow along as we progress down the road to recovery. Guides you through self-managed, on-demand exercise therapy that adapts to your unique circumstances, abilities and personal goals. No fees - $0 co-pay. Using our field-tested best practices with Fortune 100 clients and Insurers, we guarantee success and can get your program up and running in as little as 6 weeks. Cost control on healthcare spending. The best workplace health package for members. Care built around members and their families. See exactly how SimpleTherapy benefits members’ pain recovery. See exactly how SimpleTherapy impacts your employees’ care decisions to establish a new starting point for preventative care. See how SimpleTherapy impacts the quality of life. After all it’s not just about the ROI. 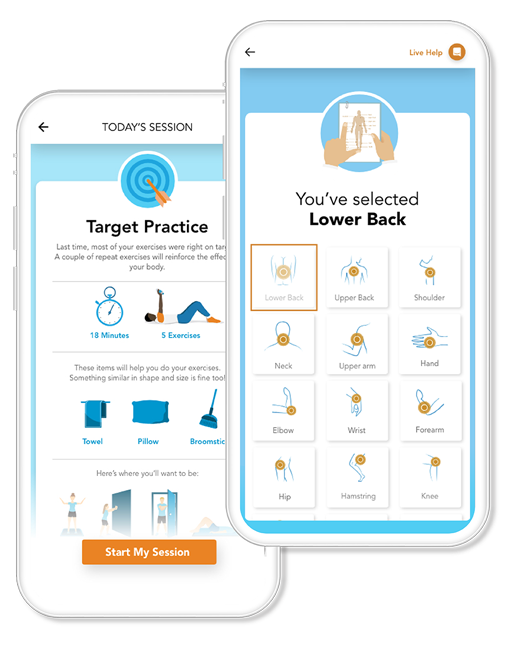 Offers video-based, head-to-toe exercise therapy programs that target the joint, muscle, tendon, and/or ligament that are causing you distress. SimpleTherapy® does not offer medical advice, diagnosis or treatment. SimpleTherapy is not a replacement for a physical therapist or doctor. Please consult with your physical therapist or doctor if you have any questions about incorporating the SimpleTherapy sessions into your wellness program. © 2019 SimpleTherapy, Inc. All rights reserved.